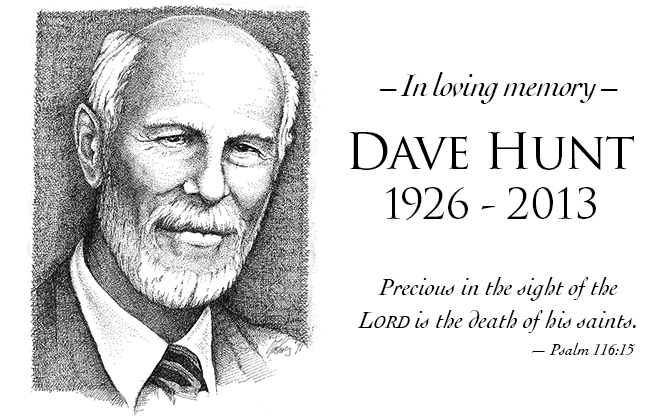 This is a transcription of Dave Hunt’s final talk at our TBC conference in 2008. It has been edited for space and readability. The full talk is included in the audio version of this month's newsletter. In Revelation:22:1: “He showed me a pure river of water of life, clear as crystal, proceeding out of the throne of God and of the Lamb.” I think you know that is not H2O. The Bible does use metaphors. When you take the bread and the cup in remembrance of Christ, that is not His body and blood. It’s a symbol, and we do this in remembrance of Him. Why do they need healing? I don’t understand it, but our focus is on the Lord. “There shall be no more curse, but the throne of God and of the Lamb shall be in it, and his servant shall serve him” (v.3). So the throne of God to the very end is the throne of God and of the Lamb. And the Lion of the tribe of Judah is the Lamb, and He is there as though He had just been slain. The Bible says so much in a few words. Why would you find dragons everywhere—all over the East, on the temples, and so forth? Why do you find serpents? Satan loves to be called a dragon. He’s not ashamed to be called a serpent. He loves to be the serpent! Praise God! “And the great dragon was cast out, that old serpent, called the devil and Satan, which deceiveth the whole world…” (v.9). He is the deceiver. He deceives the whole world! “…He was cast out into the earth, and his angels were cast out with him. And I heard a loud voice saying in heaven, Now is come salvation and strength and the kingdom of our God and the power of his Christ, for the accuser of our brethren is cast down, which accused them before God day and night” (vv.9-10). We see that “accuser” in the book of Job. The sons of God appear before God, and Scripture says, “And Satan came with them.” Satan still has access to God, and he has authority. “Make way!” cried the haughty outrider. “You’re blocking the king’s highway. Our lady is late, and her majesties wait. And he cried to the driver, “Nay! And what hast thou to offer, thou man of sorrows unknown? He gently said, “My blood was shed to purchase her for my own. And then she’s converted. She takes off her jewels and her coronet, and lays them, as it were, at the Savior’s feet. Satan thinks he’s going to win. Look at what he offers! But what does Jesus offer? “You’re not of the world. I’ve chosen you out of the world. Because you’re not of the world, the world will hate you. If you want to follow me, take up the cross, follow me. That’s where we’re going” (John:15:29; Matthew:16:24; Luke:9:23; Mark:8:34; 10:21). So, we come to the climax throughout the Bible. In Job:13:15, Job says, “Though he slay me, yet will I trust him.” Job was an overcomer through the blood of the Lamb! In 1 John:4:19, we read: “We love him because he first loved us.” I love the Lord! Why do I love Him? There must be a reason why we love Him. In fact, there are many reasons! Have you told Him today, “I love you, Lord”? You should tell Him over and over. I tell my wife every day, “Ruth, I love you more today than before! You are beautiful, and I love you so much!” You ought to tell your wife, your spouse, but we need especially to tell the Lord. In fact, it is a command. When He was asked, “What’s the first and great command?”, Jesus replied, “The first commandment is Thou shalt love the Lord thy God with all of thy heart, with all thy soul, with all thy might, and the second is like unto it…thy neighbor as thyself” (Matthew:22:37). And the psalmists, the apostles, cry out “O that I might know him!” And you know what keeps us from knowing Him? And being like Him? John gives that to us in 1 John 3: “When we see him, we will be like him, for we will see him as he is.” Now we see through a glass darkly…. I sometimes cry, “Lord, I don’t even know You! I wish I knew you better!” It’s beyond our ability, but one day when the veil is removed, the blindness of our hearts and eyes will be gone. We will see it suddenly! This is Jesus as He really is! And that is going to transform us. He wants us to understand , so He says, “When they hear the word and they don’t understand, then comes the wicked one and takes out of the heart the seed that was sown.” We’ve got to get people to understand! This is Paul’s prayer: “The eyes of your understanding being enlightened, that you may know what is the hope of his calling, and what is the riches of the glory of his inheritance in the saints….” We have an inheritance. We have an inheritance in Him. It’s going to be glorious for all eternity. I don’t fathom that, but I do get some inkling of it. This is the greatest demonstration of God’s power—that He could save sinners, those who hate Him; that Christ would die for them, and that somehow He would pay the penalty. That is something that I’ve discussed with philosophers. It is not just! The innocent man is punished for the guilty! And that brings forgiveness? How can the innocent pay for the sins of the guilty? It’s not just. How is that going to do anything for God—or for anybody? Paul tells us, Galatians:2:20: “I am crucified with Christ.” It wasn’t just that Christ died. We died in Him . I don’t know how God works that out, but haven’t we experienced it? I know that something happened to me. He did something that transformed us that Satan doesn’t understand. We were born again through faith in Christ when we accepted Him as our Savior and we recognized that He died for us—in our place! That does something. ). That’s what God accomplished. Satan doesn’t understand it to this day, and he probably never will—but he will face the consequences of it. Islam is spread by the sword. I sometimes quote them facetiously, “Islam is peace. And if you deny it, we’ll kill you to prove it!” I wish that I could reason with Muslims. Are they convinced? People used to talk about “shotgun” weddings, but we don’t even bother with that anymore. You don’t drag your bride to the altar by her hair with a gun in one hand and say, “You will marry me, and you will promise to love me!” That’s not the way it works. You haven’t won her heart, and God is not going to get us to heaven by threats, but by love. This battle is going to be won by love. I remember the hymn, “O the deep, deep love of Jesus…” It’s a mystery. “I am crucified with Christ.” Something happened when I met Jesus. I was born again by the Spirit. And He’s promised us something. We read it in Ephesians 1—Paul is praying that these people will know the hope of His calling . First Peter 5:10 tells us what is the hope of His calling: “But the God of all grace, who hath called us unto his eternal glory, by Christ Jesus, after you have suffered a while, make you perfect, stablish, strengthen, settle you….” So the God of all grace has called us to His eternal glory! By contrast, atheism is materialism. There is nothing but matter. Francis Crick, atheist, co-discoverer of the DNA alphabet, said: “You, your joys, your sorrows, your memories, your ambitions, your sense of personal identity and free will are in fact no more than the behavior of a vast assembly of nerve cells and their associated molecules.” Isn’t that wonderful to know! It is meaningless! It is hopeless! What is the hope that the atheist offers? According to them, a quiet grave at the worst. Listen to Bertrand Russell: “All the labor of the ages, all the devotion, all the inspiration, all the noonday brightness of human genius, are destined to extinction in the death of the solar system.” It couldn’t be said more clearly. One day all of the dreams, one day all of the corporate ambition and all of the monuments man has built, the skyscrapers and all the libraries will be burned up. They’re gone, like sandcastles washed into a cosmic ocean of nothingness. What did it all matter? And when “Sagan the Pagan” got in the presence of the cosmos, he exulted, “Oh! The cosmos ! Do you want to know who you are? Why you’ve got nitrogen, you’ve got hydrogen cells in your body that once were part of a distant star system, and they’re in your body! And one day, some of the molecules in your body will be out there in another star system….” I think that’s insanity cloaked in pride, and they’ve all got a good dose of it. Do you remember the first food and drink that was consumed on the moon? It was the bread and wine of communion! Atheists say, “No scientists believe in God.” Yet these men were scientists. God is being glorified, and the poor atheist doesn’t understand that He has something wonderful for those who love Him: “Eye has not seen nor ear heard, neither has it entered into the heart of man the things that God has prepared for those who love him” (1 Corinthians:2:9). Listen to the hopelessness of atheist Sam Harris: “Tens of billions of viewers passed in the growing darkness of a universe condemned to become a galactic graveyard.” That’s what they have to look forward to. That epitaph is pronounced in advance upon everything that Bertrand Russell wrote, everything that Dawkins ever did or wrote, so why do they insist, “I want to convert you to atheism! I want you to hate God. And I want you to have this beautiful future lying ahead of you. What a hope we give you!” Expending such a great effort to extend their life, merely to stave off death a short while longer in order to leave some meaningless record of one’s having been there. But there’s no record. Nothing will be left of all the proud structures that man has built. I love you, Lord! Why? Spend a little time in His presence beholding the beauty of the Lord. Get to know Him. “No,” he said, “my heart was filled with darkness.” You don’t sing about how you love Krishna. You don’t sing about how you love Shiva, the Destroyer. You don’t sing about your love for Muhammad, or Allah. But these people—who were they? What had happened to them? And what a love they had for this God whom they serve and worship, and for this Jesus who had died for them. Eventually, Rabi was on his knees before the preacher, who happened to be a former Muslim, a schoolteacher. And he didn’t need to have an “exorcism.” He said that as soon as he put his faith and trust in Jesus Christ as the one who had died for his sins, “tons” of dark things went out of him. Something happened to us all. We love the Lord. I love the Lord because He’s heard my cry. I love Him because He first loved me. How could you not love Him? I speak to my own heart. It’s amazing what God can do in our hearts if we allow Him. It’s the new birth. We’re born from above, born in the Spirit of God, when we believe the gospel message. Why do we preach the gospel? People don’t have a transformation if the Word of God doesn’t come into their hearts and they don’t understand who they are in sin, or who Christ is and why He came, and then believe this. We don’t come to God as that proud lady driving in her chariot with all of her jewels. We come as broken sinners, recognizing our guilt and our need of Christ. The Bible is so clear: “The wages of sin is death” (Romans:6:23). That’s what Dawkins is reaping. That’s what “Sagan the Pagan” reaped. That’s what the cosmos gave him. Death. The cosmos—finally all dead. “The wages of sin is death…,” but it’s even worse than that. The second death is the Lake of Fire, and it goes on forever and forever and forever. An eternal dying, with regret and remorse: “How could I have been such a fool? I didn’t need to be here. Christ died for me. He paid the penalty for my sins, and here I am because I rejected Him.” No hope…. “…But the gift of God is eternal life through Jesus Christ our Lord” (Romans:6:23). Let me remind you what a gift is. If you are going to receive forgiveness, if you are going to receive eternal life from God, you must receive it as a gift. A gift? What does that mean? It means you can’t work for it, you can’t earn it, you can’t merit it. A lot of people try to pay for the gift of God with church membership, good deeds, penance—it won’t work. Everybody’s on the same level. We come as hopeless, lost sinners for whom Christ died, and we must be willing to receive a gift. The gift of God is eternal life. You don’t want a gift? You want to work for it? You want to earn it? You want to show God how good you are? And that you deserve it? Sorry! You must receive this as a gift, and you can’t pay for a gift. “The gift of God is eternal life, through Jesus Christ our Lord.” He can’t give it to you any other way, but only because Christ paid the penalty for our sins. To summarize what’s been going on here, we are in a cosmic battle for the universe, and we’ve read the end of the story: war in heaven, Satan and his demons—his angels—are fighting against Michael and his angels, and Satan does not prevail and he’s thrown out, because the Lion of the tribe of Judah, who defeats them all, is the Lamb! A slain Lamb is on the throne. You think about that. You ponder it. I don’t want to forget the Father, because the Father sent the Son to be the Savior of the world. He knew what was going to happen. He knew that His Son would be mocked and hated, spat upon, crucified, and you see that so beautifully in Genesis 22. I love that verse: “So they went both of them together .” Abraham and his son. It was a joint operation. We don’t want to forget God the Father, who gave His Son, and Christ, who suffered for our sins—they went both together. Prayer: Father, you are so wonderful. Your grace and your love are beyond our comprehension. Lord, we love you because you first loved us, and herein is love, not that we loved God, but that He loved us and sent His Son to be the propitiation for our sins. And you demonstrate your love, Lord, in dying for our sins. Who could doubt it? Who could doubt that you love us? You never sinned, but you were treated as though you were all of the sins of the world, and you were punished in our place. Lord Jesus, we love you. God and the Son, the Holy Spirit—a joint operation, “I and my Father are one.” We don’t understand it, but, Lord, we want to draw closer to you. We want to please you in our lives, we want to serve you, we want to honor you, and, Lord, we want to take this glorious gospel, without which no man can be born again, wherever we go. So, Lord, give us opportunities and help us. And, Lord, we just love you, and may that be reflected in our lives, we pray. In Jesus’ name. Amen.